While a consistent skincare routine is the most obvious way to keep acne at bay, there are tons of other factors that play into the health of your complexion. If you’re the type of girl who wears a full face of makeup every day, regularly cleaning your makeup brushes is imperative to keeping your face breakout-free. 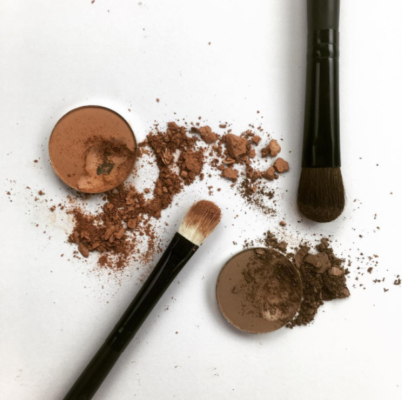 Why is it so important to clean my makeup brushes regularly? In general, anything that’s coming in contact with the skin on a regular basis should be cleaned frequently (remember the importance washing your pillowcases regularly?) to avoid any buildup of bacteria, dead skin cells and oil. Makeup products — especially concealers and foundations — typically contain hydrating components, which provide a perfect breeding ground for bacterial growth. Because breakouts occur when bacteria and dead skin cells become trapped in the pores, massaging a bacteria-laden brush into the skin is an extremely common way in which bacteria gets driven into the pores. How regularly should makeup brushes be cleaned? Daily! Sephora Collection The Cleanse: Daily Brush Cleaner is a great example of a quick, effective brush cleanser — just spritz it on, gently dry bristles with a microfiber cloth or paper towel, and you’re bacteria free! A quick spritz of rubbing alcohol or a homemade concoction that incorporates tea tree oil will also cut down on bacterial buildup. However, too much alcohol can dry out the bristles over time, so try to keep this to a minimum. Should I be deep cleaning my makeup brushes too? Yes, absolutely! Once a week is generally best. Use a brush shampoo like EcoTools Makeup Brush Cleansing Shampoo and work it lightly through damp bristles with warm water, then lay the brushes on a towel to dry. Baby shampoo also works well, as does dish soap. Using a more robust cleanser helps to ensure brushes are fully cleansed and no bacteria is lurking within the base or deep within bristles. Why shouldn’t I use the shampoo I use on my own hair to deep clean my brushes once a week?